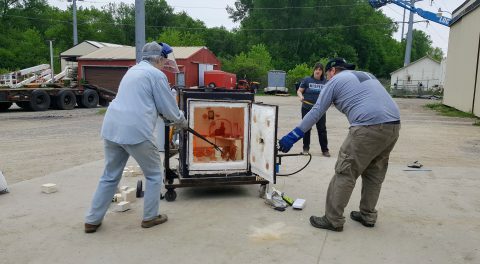 Three Studio ArTour artists from Faribault participated in the Paradise Center for the Arts spring Raku firing at Lockerby Sheet Metal in Faribault. 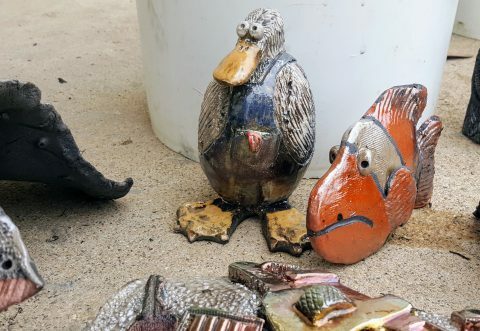 Dianne Lockerby (studio #10), Tami Resler (studio #11), and Julie Fakler (studio #10) all fired their one of a kind Raku pieces this past Saturday May 19th. All three artists will be selling their Raku pieces at this year’s Studio ArTour! Raku pottery is fired at a relatively low temperature and then moved while hot to a closed container with combustible materials (such as paper or sawdust) that ignite and cause a reaction creating colors and patterns in the pottery’s surface. In the above photo, the duck figure on the left is a Tami Resler Raku pottery piece. The fish on the right is a Dianne Lockerby Raku pottery piece. 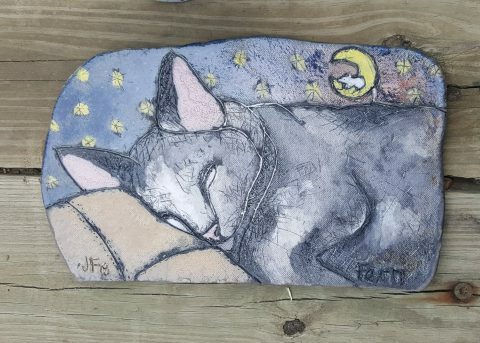 Julie Fakler’s portrait of Fern, Raku pottery. All three artists are looking forward to the Paradise Center for the Arts next Raku firing November 3, 2018.